Brandon Jack will play his first game in over 12 months on Saturday afternoon. Brandon Jack will play his first AFL game in over 12 months after the young forward was selected as one of three changes for Saturday’s clash with Carlton. Jack last featured at senior level in the Swans’ 2015 semi-final loss to North Melbourne at Stadium Australia. The 22-year-old left-footer played 17 games for the NEAFL Swans last season, averaging 26 disposals and kicking 14 goals, coming into calculations twice when selected as an emergency for the senior team. Jack joins Nic Newman and Jeremy Laidler in replacing Kieren Jack (hip), Jordan Foote (omitted) and Harry Marsh (hamstring) for the Round 6 encounter at the MCG. 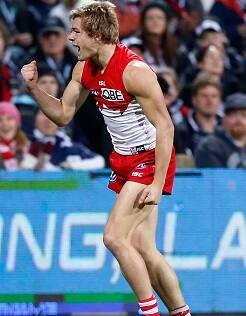 “He’s been one of our more consistent performers,” Longmire said of the younger Jack. “He didn’t play at all last year, despite putting in some pretty consistent performances in our reserves. “He’s kept pushing his case, kept playing well week in, week out, and you can’t ask for any more than that. Marsh was a last-minute omission after pulling up with a tight hamstring during Thursday’s training. The dashing defender has been one of the Swans’ consistent performers this season, averaging 16 touches across his five games at the top level. In a similar vein to McVeigh’s last week, Longmire believed the setback was only minor but it was too early to know the exact timeframe Marsh will be out for. “He’s had a history of previous injuries in that area so it’s just too big of a risk to play him,” Longmire added. Saturday’s clash marks the first time since the 2005 Grand Final the Sydney Swans will be without Jarrad McVeigh and Kieren Jack. It’s been much longer, 1986 in fact, since the Sydney Swans have played Carlton at the MCG. Commentators will need to refer back to the 1986 Qualifying Final to the clubs’ last of nine meetings at the famous venue, of which Carlton holds sway with five wins. Click here to see the full team.